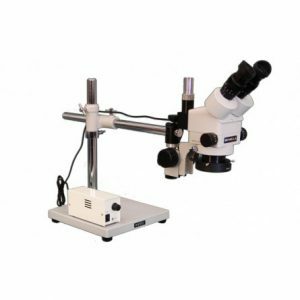 Stereo microscopes are low power microscopes which are also called dissecting, dissection or inspection microscopes. Stereoscopes have low power or magnification range which is mainly 10x-70x (10-70 times bigger than actual). 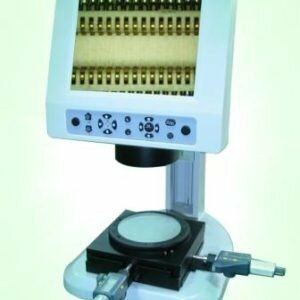 Stereo microscopes are used for inspection and visualization of stamps, coins, mobile parts, printed circuit board (PCB), insects, plants, seeds, fruits, veterinary, anatomy, nearoanatomy, zebrafish, in vitro fertilization (IVF), music instrument parts (strings, CDs,…), material surfaces, ….. . Adding a polarization kit, stereoscopes can be used for inspection of rocks, minerals, and fossils. 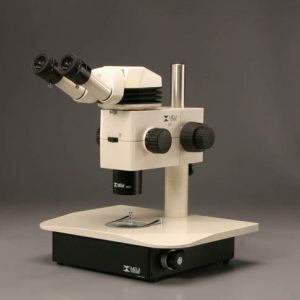 Advanced studies in this regard, which requires higher magnification, can use Polarizing microscopes or metallurgical microscopes. 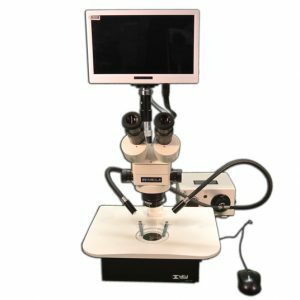 Researchers in zebrafish, embryo, IVF, bacteriophage, and microfluidics on small animal models like c-elegant use fluorescence stereoscopes. 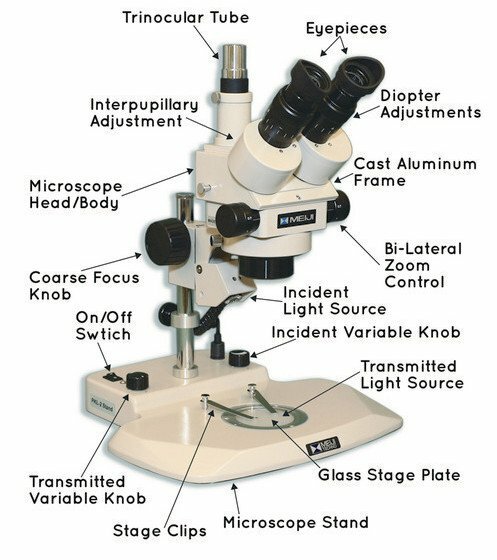 Using auxiliary (or aux) lenses, you can extend the magnification or field of view. With a 2x aux lens, 30x eyepieces, in a regular stereoscope (0.7x-5.6x), the max magnification can be 336x. If a smaller magnification aux lens such as 0.5x or 0.33x is used, the working distance (WD) and field of view (FOV) will be increased and you can expect to see as large as 50mm FOV and over 200mm WD. Contact us for such a configuration. By default, all light microscopes generate brightfield images, i.e. specimen is seen with a bright background. It is possible to see the images with a dark background, i.e. darkfield images. To compare this, think of seeing an airplane in the sky during the day (brightfield) versus seeing it near sunset (darkfield). You can add a darkfield and polarization kit to a stereoscope to make it much professional. Contact us for further details. Working distance: at physical stereoscope has 80-90mm WD. illumination: Reflected for opaque sample and transmitted light for transparent samples. A client wrote us: Interested in a trinocular zoom stereoscope with the widest field of view (to the camera, we have a Lumenera Infinity2-1R, 1/2″ 1.4 MPixel) possible. Probably would need 0.5X aux lens. BUT CAN YOU PROVIDE for me with the field-of-view we could achieve (with our camera)? We need to use this to teach neuroanatomy, meaning about 2 cm horizontal field of view (at lowest mag setting). To get the largest field of view (FOV), a good combination of the camera sensor and the c-mount adapter is the key. As you know well, we see circular in eyepieces but a camera sees a rectangular or square. Depending on the c-mount adapter magnification, we can fit the camera FOV square or rectangle into the eyepiece circle. If we go further than eyepiece FOV circle, there won’t be any signal to the corners of the square. Then the sensor will generate an image with black corners (called vignetting). Depending on the stereoscope model, it is possible to get ~20-22mm width image assuming a perfect camera-adapter is used. In most cases, we can reach this without a 0.5x aux lens. Since you like to use your own camera with 1/2” sensor, we need to provide a 0.5x c-mount adapter. You need to use BSM330T or higher models to get such a large FOV. Using a 0.5x aux lens will be an advantage. We have done some works and sending you the images in a separate email via an external link. Please read these comments before and after viewing those images. – we tested so many c-mount adapters, including default and custom 0.35x, 0.5x and 1x c-mount adapter with your Infinity 2 Camera. Some of the images are presented. – The 0.35x gives largest FOV but it has some vignetting issue, as expected. – The custom 0.5x c-mount adapter gives a better result with your camera. However, it has a minor black corner on one side. You may not like it. 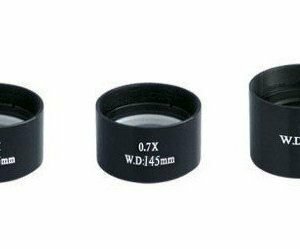 – The 1x c-mount adapter helps you increase the magnification twice in comparison to 0.5x c-mount adapter, i.e. it will be like using 20x/FN10 eyepieces vs 10x /FN20 or adding a 2x aux lens. 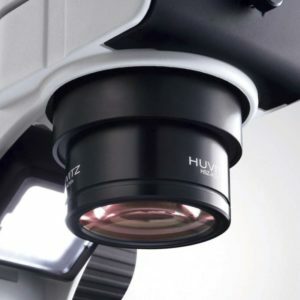 – Using a calibration slide, now we know your camera has an FOV of 20mmx15mm (HxV) at the lowest magnification 0.7x zoom. 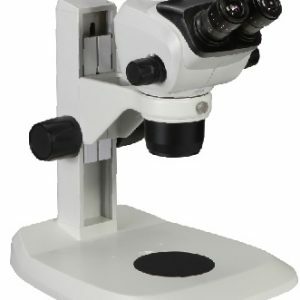 If you do not like to have black corners in your images, you need to either upgrade the microscope or change the camera. This will depend on your budget. Thus, I tested this with our BIC-T3C-2.3C 2.3MP 1/1.2” CMOS camera. 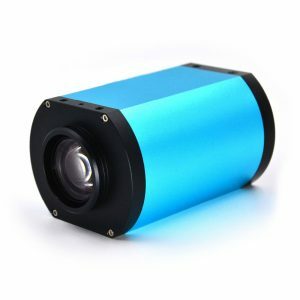 – This camera has an FOV of 22.5x14mm (HxV) at the lowest magnification 0.7x zoom. – Some sample images were also shown. – Frankly speaking, this camera has better image quality, much more natural color and higher sensitivity than yours. I guess ours has also better price, i.e. $1,089 USD. Last but not least, we also used our BioStitch Live Image Stitching Software and manually stitched your sample images at the highest zoom of 4.5x and 0.5x c-mount adapter. Using 1x c-mount adapter will increase the resolution twice. If you decide to get the BIC-T3C-2.3C camera, we can offer this software ($1,499) totally free. Result: the customer was extremely happy with the prepared images, purchased the stereoscope and enjoyed it. Thanks Brian Kloepfer, Carolina Biological Supply Co.